Congratulations on your award! PINK, Allie, PINK! Those are GREAT choices to pass the award along to! Thanks for playing. Thanks for sending the award our way! We are glad you think they're as pawesome as we do! There are some wonderful bloggers out there! Congratulations and I love the answers (way to go Allie). You are gracious in your nominations too. Each blog I have visited and each blog lifts the spirits with the work they do. FaRADaY: MOL Austin! HIGHPAW on that one! Allie, I love everything pink, too! We must both have the pink gene! Allie: Girl, don't you know it! PINK Power Rules! What great answers and what great peoples yous passed the award on to AND Congratulations on winning! Me thinks yous guys is the bestest, now me has to go check out BZ TAT! You'll love her, Nellie! She's a fab artist and has done some great drawings of ALlie & The Boyz, too! Congrats on your award...we really enjoyed reading your answers to those questions. Concats! How exciting and we enjoyed the meme too. We aren't familiar with the blogs you picked to pass it on to except Mario, and we con't agree more! What a great kitty! Oh thank you! 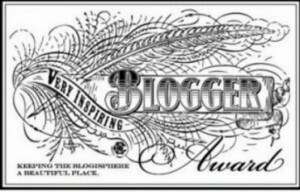 We know you'll enjoy the other bloggies too! Well hello there! Thanks for liking us today on Facebook! We had to come by and say hey. And what a perfect day! ...with the whole get-to-know-you blog. Congratz on the cool award! FaRADaY: *waves paw* HI there, Miz Girly! Mommy sez your dad and our grandpa worked at the same place! She sez you & her are the original Space Cadets cuz you grew up surrounded by it! MOL! 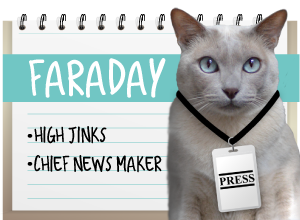 ....and thanx for posting our casting call for The Real Housecats Of The Blogosphere! 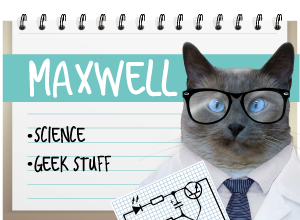 Faraday: Maxie! Quit blushing! Just say thank you! Great answers. I agree with Faraday on wand toys. Can never have too many. 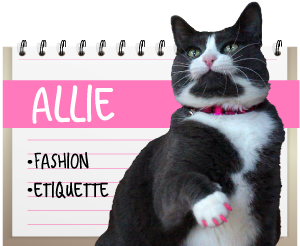 I think Allie would be purrfect for Real Housecats! Allie: Oh Mothererrrrrr! Can I enter? Please?? ?